These screws are ideal for fastening other types of brackets that have an existing hole (or a hole that can be added) in the bracket, allowing specialty brackets (such as weed whackers bracket, shelf brackets, hose racks) to be mounted onto the rail. They also allow a means of fastening the rail by splicing to another rail. Using a 1/2 socket on a powered driver, the threads are quickly formed in the rail. 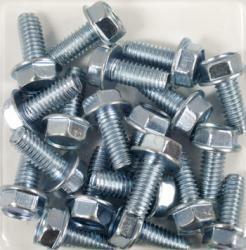 If necessary, a longer bolt can be used in place of the 3/4" long screw.